I will be presenting a one day professional development workshop on R programming for software developers and data scientists, sponsored by the ACM San Francisco Bay Area Professional Chapter and Revolution Analytics. 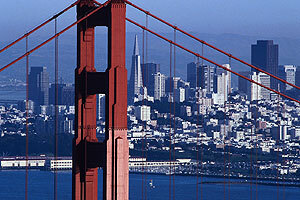 Details are available at http://www.sfbayacm.org/event/introduction-r-software-developers-and-data-analysts. I am very excited about this opportunity and will provide more information as the date approaches. 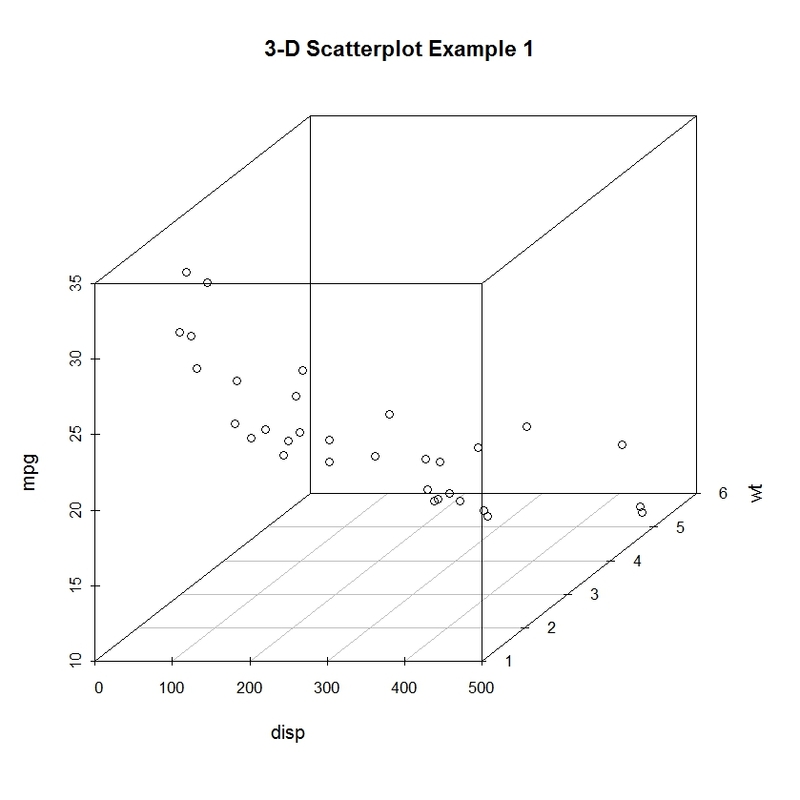 R has some great functions for generating scatterplots in 3 dimensions. 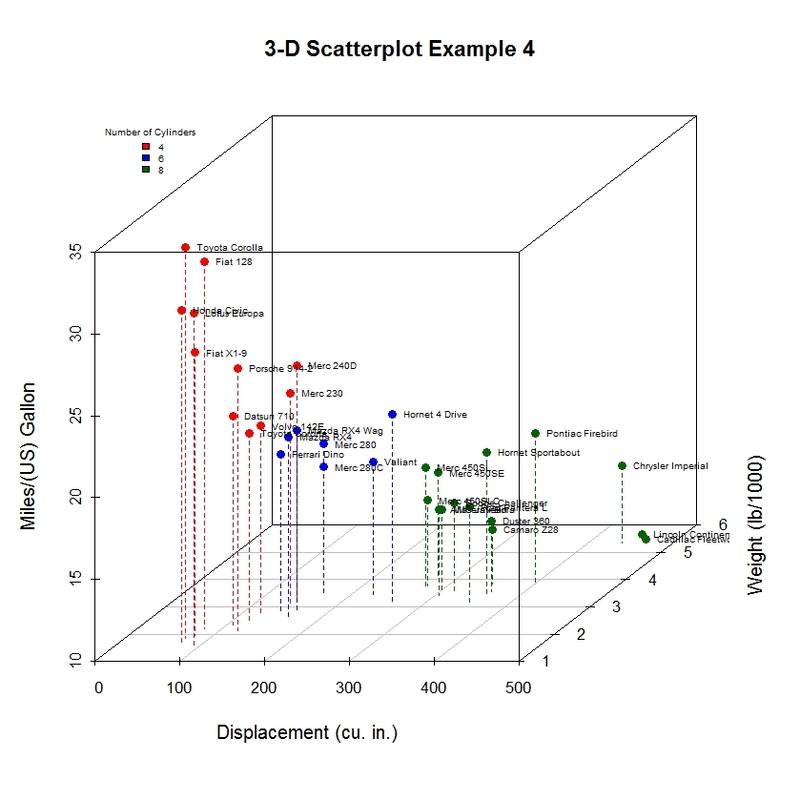 Two of the best are the scatter3d() function in John Fox’s car package, and the scatterplot3d() function in Uwe Ligges’ scatterplot3d package. 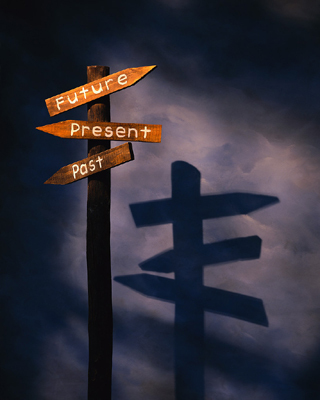 In this post, we will focus on the later. Let’s say that we want to plot automobile mileage vs. engine displacement vs. car weight using the data in the mtcars dataframe. The resulting plot is given below. Now lets, modify the graph by replacing the points with filled blue circles, add drop lines to the x-y plane, and create more meaningful labels. Next, let’s label the points. 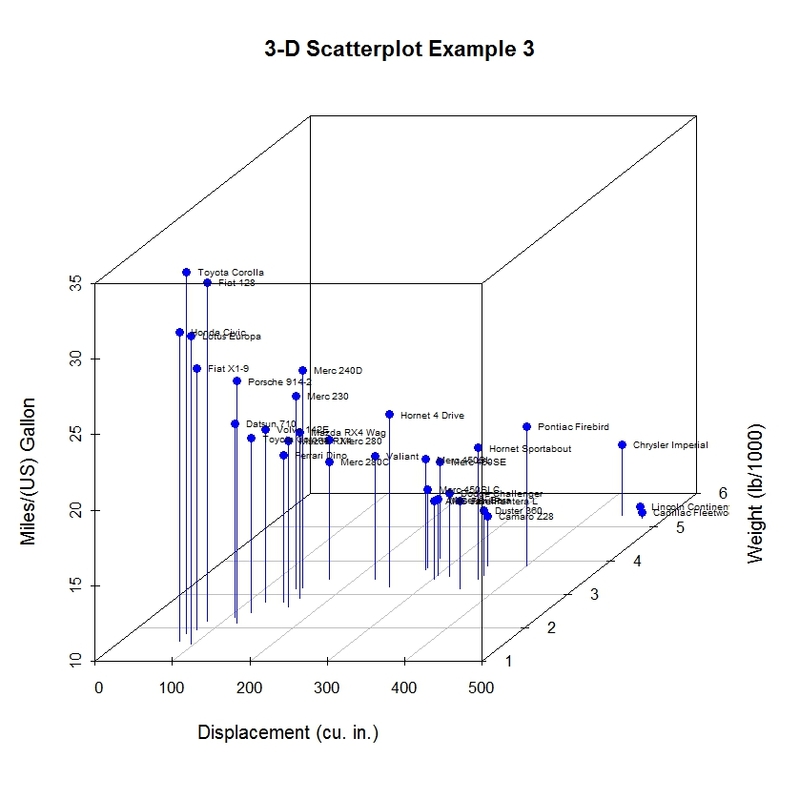 We can do this by saving the results of the scatterplot3d() function to an object, using the xyz.convert() function to convert coordinates from 3D (x, y, z) to 2D-projections (x, y), and apply the text() function to add labels to the graph. Almost there. 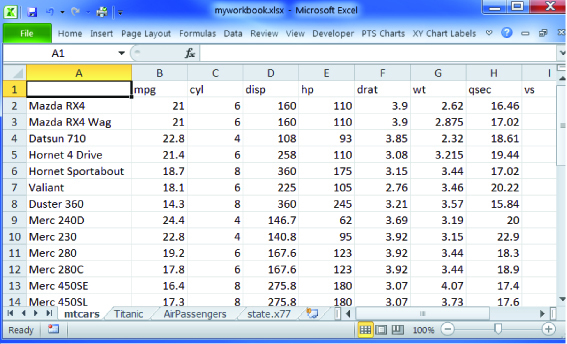 As a final step, we will add information on the number of cylinders each car has. To do this, we will add a column to the mtcars dataframe indicating the color for each point. For good measure, we will shorten the y axis, change the drop lines to dashed lines, and add a legend. One of R‘s most attractive features is that it allows us to manipulate output and deeply customize graphs. This article has just touched the surface. Since colors and text labels can be input as vectors, you could programmatically use them to represent almost anything. For example, point colors and/or labels could be used to highlight observations that are outliers, have high leverage, or are unusual in some other way. Simply create a vector that has colors or labels for notable observations and missing (NA) values otherwise. No, I don’t mean late night coding. R is constantly changing – both as a language and a platform. Updates containing new functionality are frequent. New and revised packages appear several times a week. 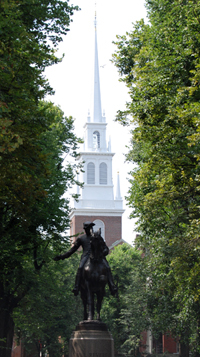 Staying current with these myriad changes can be a challenge. In this post, I thought that I would share some of the online resources that I have found to be most useful for keeping current with what is happening in world of R.
Of course the R project homepage (www.r-project.org) and the Comprehensive R Archive Network (CRAN; cran.r-project.org) are your first stops for all things R.
CRANberries (dirk.eddelbuettel.com/cranberries/) is a site that aggregates information about new and updated packages, and contains links to CRAN for each. Planet R (planetr.stderr.org) is a great site aggregor, and includes information from a wide range of sources (including CRANberries). This is my first stop for staying up on new packages. R Bloggers (www.r-bloggers.com) is a central hub (blog aggregator) for collecting content from bloggers writing about R. It contains several new articles each day and I am addicted to it. It is a great place to learn new analytic and programming techniques. The R Journal (journal.r-project.org) is a freely accessible refereed journal containing articles on the R project and contributed packages. This is a great way to gain deeper insight into what specific packages can do. The Journal of Statistical Software (www.jstatsoft.org) is also a freely accessbile refereed journal and contains articles, book reviews, and code snippets on statistical computing topics. There are frequent articles about R.
Finally, R-Help, the main R mailing list (stat.ethz.ch/mailman/listinfo/r-help), is the best place to ask questions about R. Be sure to read the FAQ before posting or you may get flamed by veteran programmers. The archives are searchable and contain a wealth of information. These are my favorites – the ones I go back to again and again. What are yours? A common task when analyzing multi-group designs is obtaining descriptive statistics for various cells and cell combinations. There are many functions that can help you accomplish this, including aggregate() and by() in the base installation, summaryBy() in the doBy package, and describe.by() in the psych package. However, I find it easiest to use the melt() and cast() functions in the reshape package. As an example, consider the mtcars dataframe (included in the base installation) containing road test information on automobiles assessed in 1974. Suppose that you want to obtain the means, standard deviations, and sample sizes for the variables miles per gallon (mpg), horsepower (hp), and weight (wt). You want these statistics for all cars in the dataset, separately by transmission type (am) and number of gears (gear), and for the cells formed by crossing these two variables. 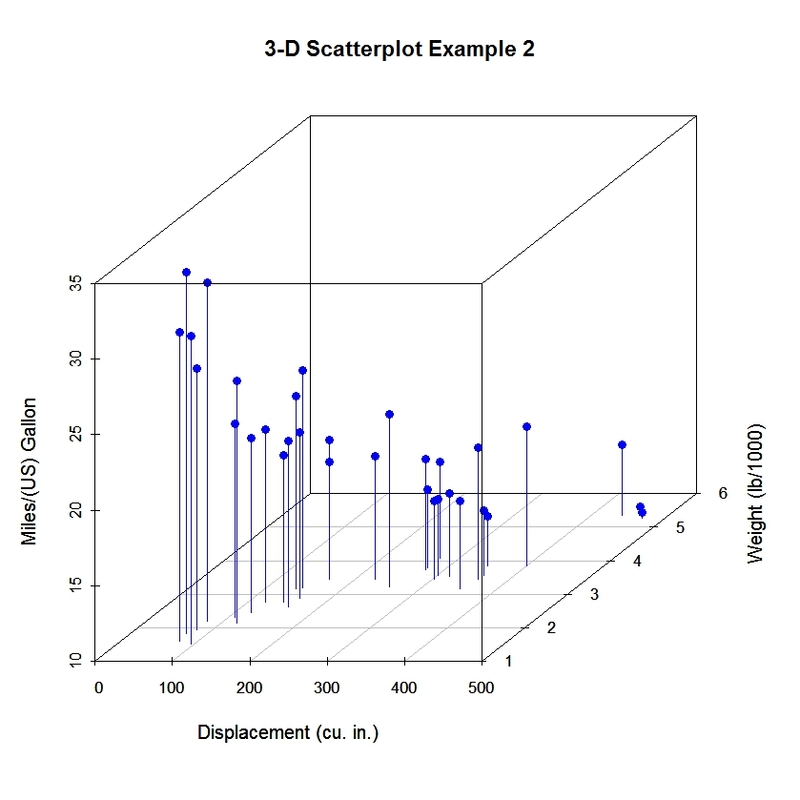 The approach is easily generalized to any number of grouping variables (factors), dependent/outcome variables, and statistics, and gives you a powerful tool for slicing and dicing data. After maintaining the Quick-R website (R tutorials and jumpstart) for the past 5 years, I’ve decided to add a blog so that I can go into more detail on topics related to practical data analysis. 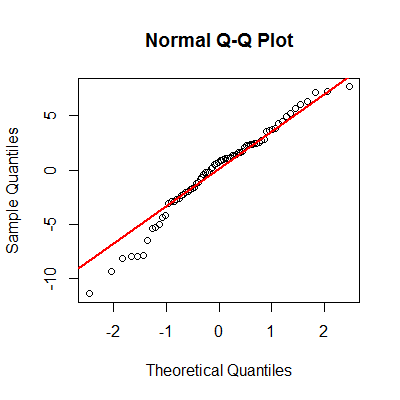 The statMethods blog will contain articles about data analysis, statistics, and graphics, with an emphasis on the R language. Of course, I’ll continue to maintain Quick-R, and hope that you find this addition resource useful. Let me know if there are topics that you would like to hear about. 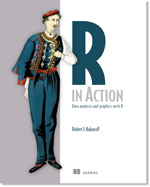 Practical data analysis and graphics with R. Enter code ria38 for a 38% discount. © 2011 Robert I. Kabacoff, Ph.D.